I made this video at an exhibit at the children's museum we took the kids to... This was the first animation I did in about 20 years. Filmed off a monitor with my cellphone, so the quality is even worse than you would expect. Art show, originally uploaded by biroschik2000. Cecilia’s drawing that was featured in the diocese-wide art show. 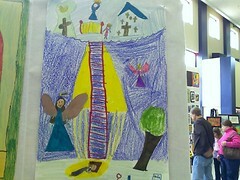 This mixed media picture depicts Cecilia’s interpretation of Jacob’s Ladder. 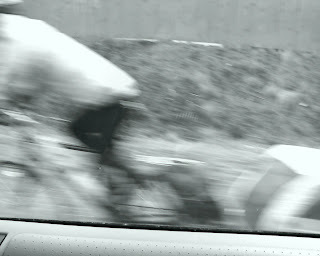 Well, actually I don't like riding my bike as much as the next guy since this dude is hauling a kid stroller behind his bike on a very busy, and very shoulderless, road.